Putting on my BuskerFest Game Face! Tonight I visited with Nathalie Simard, makeup artist and owner of Kromatic face and body painting out of Quebec City. As you can see from my pictures below, Nathalie is an extraordinarily talented artist who totally transforms your look in a 'Cirque Du Soleil' style that will AMAZE you. Nathalie has flown into Niagara Falls for the second annual BuskerFest that starts tomorrow night on Queen Street in Downtown Niagara Falls. Nathalie can be found near the Seneca Queen theatre working her magic. 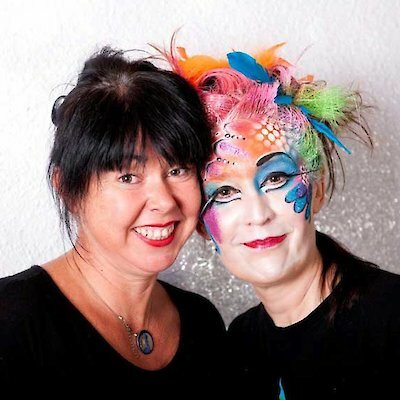 With over 25 years of professional theatre and perfomance makeup background she has mastered the fine art of creating these one of a kind looks within 20 minutes. The full hair and face makeup experience will cost only $25.00, and I can attest to the fact that it all washes off easily with soap and water. Don't miss out on this wonderful event, and post your Busker Game Face on our Facebook page, we'll load our best ones onto our website.